I have lived in the same town for most of my life. I brought up my children in this town, and thought I knew every corner of the place that might amuse them on a slow weekend. Yet only a few days ago I explored a hidden cranny that I had never known about. Maybe it wasn’t there when I was growing up. Maybe the trail and boardwalk and odd artwork were part of some recent urban development windfall project. There was no memorial plaque or park information pamphlet to tell me the history of Redwood Grove and its abandoned Nature Center. My husband and I wanted to stretch our legs, so we went to the nearest city park, tiny oasis in a dell off one of the town’s oldest streets, named for our town’s founder. Shoup Park has a little playground for tots, a climbing structure for older kids, and a corny and badly executed war memorial showing a soldier holding a baby in a way that no baby could ever be held securely unless it was already in a state of rigor mortis. It also has a 50’s era building used for meetings, misnamed “Garden House” as there is no garden visible anywhere. , with inadequate parking . It has a large main room, a stage and a kitchen, poor insulation, an antique furnace, and inadequate parking. On the far side of the Garden House is a group picnic area with a 50’s era concrete barbecue and picnic tables. It’s a pretty boring park, but there is a creek that after a good rain burbles nicely, inviting children to get wet. 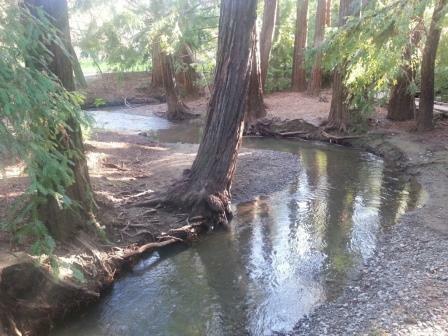 On this day there had been a rain, so we went behind the group picnic area to check out the creek. We saw a gap in the fence we had never noticed before. Through the gap and another world opened up. We were in a dell below the level of neighboring fence-in back yards. We passed an eccentric ceramic sculpture adorning what looked like a sewer access. No name, no plaque, no explanation – it was just there. The creek meandered through second-growth redwoods between banks carpeted with ivy and ferns. Sunlight filtered through the trees. The path became a boardwalk which wandered randomly beside or over the creek Along one meandering curve an erosion restraint had been built out of woven willow branches – true functional art. We came to a clearing in the grove of trees, set back from the creek. There was an abandoned house, with boarded up windows. A sign said “Redwood Grove Nature Center”, but access had long since been denied. We heard giggles, then some thumping. A back-pack sailed over the fence which sealed off access to the back courtyard of the center. The backpack was followed by four agile teen-agers who had obviously been unable to resist exploring the hidden whatever behind the fence. The quartet split up; we followed the girls who disdained the boardwark and path, preferring to wade in the creek on a balmy February day. I thought wistfully of my kids, now grown up and responsible. They would have loved to hop that fence and wade in that creek. I hope it is still there for my grandchildren to discover one day.